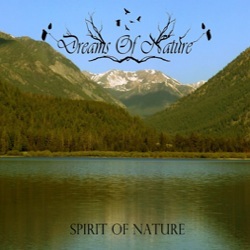 Colombian atmospheric ambient black metal band Dreams of Nature from the city of Bogotá has recently released its debut full-length album “Spirit of Nature“. The band is the personal project of L, who composes and plays all instruments. “Spirit of Nature” was recorded between 2013 and 2014 and it is a complete tribute to nature and all that surrounds it. There are two guest vocalists in this work, Zatanic Tony from Sweden who sings on “Beyond the Lakes” and Wismar Pulido from Venezuela who sings on the Summoning cover “Like Some Snow – White Marble Eyes“. The cover art was done by L himself and the photographs are taken by the professional photographer “Chase Ambler Photography”. Except for the digital version in Bandcamp, “Spirit of Nature” is also released by the Ukrainian underground label Depressive Illusions Records in a jewel-case CD-R edition, limited to 66 copies. A new version of the album will soon follow by Northern Fog Records, this time in digipak.